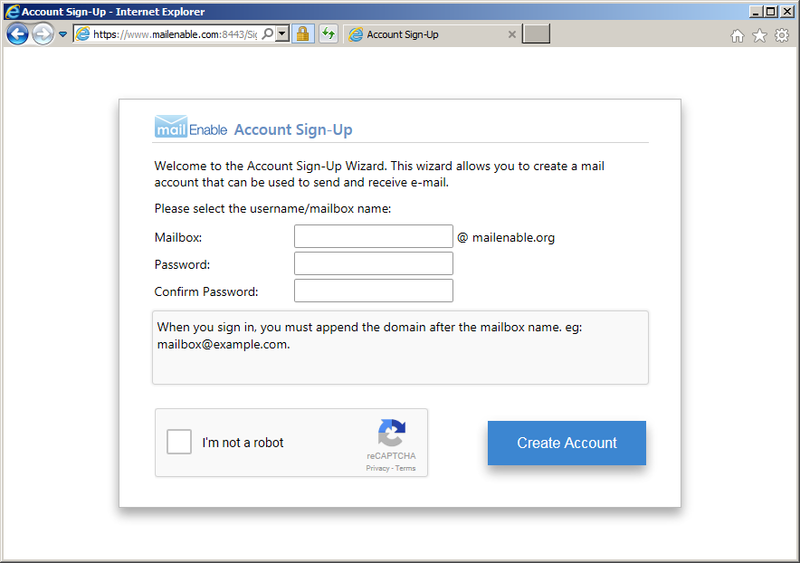 This article outlines how users can automatically create mailboxes via a web page via the Sign-Up utility. The Sign-Up utility is included in Professional, Enterprise and Premium Editions (Version 10.13 and later). It can be enabled via the administration program under the Web Mail/Properties/Advanced tab. Once enabled, it can be accessed via adding /SignUp to your base webmail URL. The options for the signup utility are stored in a file called signup.xml within the Mail Enable\Config directory. This file is created when the page is first accessed. The source code of the utility is located under the Mail Enable\bin\Netwebmail\SignUp folder and has explanations of these settings. To achieve this, you should make a copy of the signup.css file with a modified name, e.g. : signup2.css. You should then edit the Config\signup.xml file and change the CSSURL element as follows: <CSSURL>signup2.css</CSSURL>. You can then apply any changes to the style of the page within the signup2.css page. The signup utility has many options for limiting account usage so that users are less likely to abuse the services. With MailEnable Enterprise Edition it is possible to restrict access to specific MailEnable services as well as enforcing usage thresholds. This means that users signing up for web mail can be excluded/provided restricted access to POP, SMTP, IMAP, and other services (which inhibits people from abusing hosted services). However, allowing anonymous persons to signup to the mail service may lead to you being blacklisted. If you disable these thresholds and do not review your system, spammers will use the service to generate accounts and send spam, which in turn will lead to blacklisting on RBL/ORDB databases. When you upgrade MailEnable, please be aware that the install kit will overwrite the default.aspx and signup.css files in the Mail Enable\bin\netwebmail\signup directory. You may need to re-apply changes, or only edit your own copies of these files.